When the Civil War began in 1861, thousands of volunteers rallied to the colors to defend their families, their homes, and the Union—or the Confederacy—as they chose. Comparatively few of these patriotic young men were trained veterans of military campaigns or graduates of a military academy. Before hundreds of regiments marched off to war, John Penn Curry, a veteran of Indian campaigns in the West and a former US Navy officer, wrote a practical handbook for soldiers to help them survive the hardships of life in the field. Curry’s handbook was published twice, once in New York in 1861 and again in Richmond in 1862 and was used by both Union and Confederate soldiers lucky enough to find a copy. After the war, Curry’s handbook passed into obscurity. In 2006 a rare, original copy of the 1862 edition surfaced in Florida. 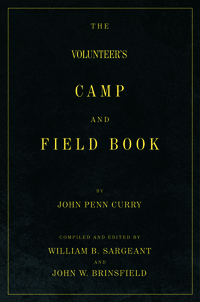 After 144 years, Curry’s Volunteers’ Camp and Field Book can provide a glimpse into basic training before the bloodiest conflict in American history. Curry’s handbook is fascinating for its practical approach to problems. Snakebite, for example, should be treated by drinking whiskey to excess since there was sure to be whiskey in camp. Even with ill-fitting shoes, soap rubbed on wool socks can prevent blisters on the march. Civil War historians and re-enactors alike will find much in Curry’s handbook to illumine the everyday lives of Billy Yank and Johnny Reb.